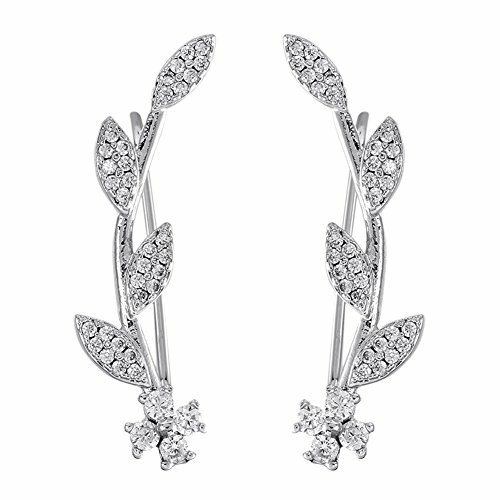 Feature:This is a set of elegant ear crawler earrings,it can fit your ear very well,it makes you like a fairy. Notice:If your ears are small,you need to wear earring backs when wearing. The meaning of the shop:DIDa is the ticking of time.And time is precious and eternal for us.High-quality products and superior service are what we will value and what we will persue forever,just like the significant meaning of time for us! 2.Avoid contacting with high temperatures and acid, alkaline solution. 3. It should be removed when bathing or swimming. Material:Ear Crawer use environmental protection copper electroplate top level 18K white gold, and ear clip wedge top level 3A cubic zirconia, nickel free, lead-free, safe and hypoallergenic. Size: length: 3cm (1.18inch); width: 0.5cm (0.2inch),because it is manual measurement, so the earrings size will be a certain deviation. A special gift:The leaves are a symbol of life,and life is so precious, so distinctive,show this affection to your mom,your lover,your daughter,your girlfriend,your best friends,in Anniversary, Christmas, Thanksgiving ,Birthday. Package:The earrings wered placed in a customed and beautiful jewelry gift box.In addition,we offer some earring backs to prepare for possible period that you will need. Services: if you have any questions,please feel free to contact us,we will give you the best service.If it is convenient,please leave a true comment on the product,which is the source and impetus of our progress. If you have any questions about this product by DIDa, contact us by completing and submitting the form below. If you are looking for a specif part number, please include it with your message.